Shortages of used equipment and lower margins mean this problem isn’t getting solved anytime soon. Growing demand for analog, MEMS and RF chips continues to cause acute shortages for both 200mm fab capacity and equipment, and it shows no sign of letting up. Today, 200mm fab capacity is tight with a similar situation projected for the second half of 2018 and perhaps well into 2019. 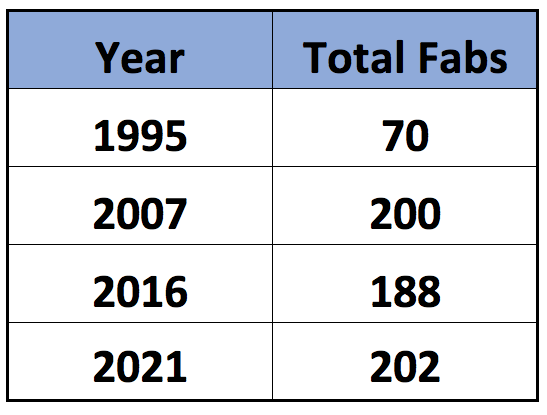 In fact, 2018 will likely represent the third consecutive year that 200mm fab capacity will be tight. The same holds true for 200mm equipment. While the demand picture appears to be a bright spot for the industry, the situation is causing angst for many customers on several fronts. The 200mm market doesn’t involve leading-edge chips produced in 300mm fabs, but rather 200mm encompasses a huge number of devices made in older 200mm fabs at mature nodes. These products include consumer devices, communications ICs and sensors. • IDMs and fabless design houses hope to meet demand for chips made in 200mm fabs. Yet it’s unclear if vendors can meet all demand, as worldwide 200mm fab capacity is expected to remain tight now and into the future. • In response, GlobalFoundries, Samsung, SMIC, TowerJazz, TSMC, UMC and others are scrambling to add or find 200mm capacity. Meanwhile, SkyWater Technology, a new foundry vendor, has entered the 200mm fray. • Even if there is 200mm capacity available, the industry is stuck as it is unable to find enough suitable 200mm fab equipment in the market. • Then, unable to secure enough 200mm capacity or equipment, some chipmakers are re-thinking their plans about building new 200mm fabs. Instead, they may build 300mm plants. Amazingly, 200mm fabs are expected to remain viable at least until 2030 or so. As before, the challenge is to procure 200mm equipment, which is still in short supply. 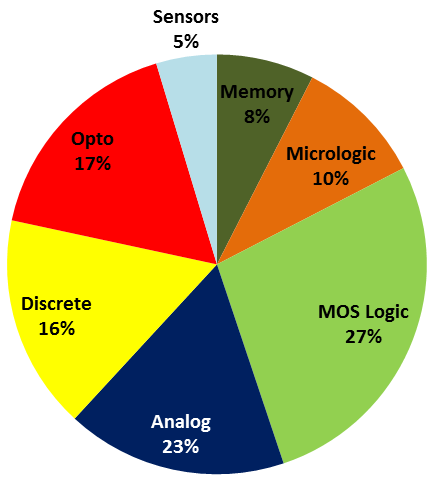 The IC market is divided into several segments. At the leading edge, chipmakers are ramping up chips at 16nm/14nm and beyond in 300mm fabs. In 300mm fabs, chipmakers also produce chips in several segments above 16nm/14nm. Both 300mm segments are expanding. “In addition to the logic capacity being added by the foundries, a significant amount of 300mm capacity is being added in Korea and China for memory production,” said Adrienne Downey, an analyst at Semico Research. But not all chips require advanced nodes. Analog, MEMS, RF and others are produced in fabs with wafer sizes at 200mm and smaller. For many of these devices, though, 200mm is a sweet spot. The first 200mm fab appeared in 1990, and the wafer size became the standard for years. Over time, 200mm was supposed to dwindle as chipmakers began to migrate to more advanced 300mm fabs in the 2000s. By 2007, 200mm reached its peak and the market began to decline. In late 2015, though, the industry saw unexpected demand for chips made in 200mm fabs. This overwhelmed the IC supply chain, causing shortages of 200mm fab capacity in 2016 and 2017. And entering into 2018, 200mm capacity remained tight with no end in sight. Still, demand for 200mm has taken the industry by surprise and forced chipmakers and fab tool vendors to take the technology more seriously. For example, foundries added more 200mm capacity with new and improved processes. And then, several fab tool vendors began to build new 200mm equipment. In total, the number of 200mm fabs in production is expected to increase from 188 in 2016 to 202 by 2021, according to Christian Gregor Dieseldorff, an analyst at SEMI. The figure includes IDMs and foundries. Amid the demand for these devices, 200mm fab utilization rates range from the “high-80 to the low-to-mid 90 percentage range,” with some reporting 100% today, according to Rosa. In 2017, 200mm wafer demand grew by 9.2%, according to Semico’s Itow. “Analog, discretes, MCUs, optoelectronics and sensors all contributed to the increased demand for 200mm wafer capacity,” Itow said. In 2018, the market is cooling off to some degree. “200mm wafer demand in 2018 will return to historical norms of 4.2% growth,” she said. One reason for the cooling off period is that fab capacity is tight and manufacturers are unable to expand. Plus, even if device makers want to expand, there is a dearth of equipment. Generally, customers are happy in terms of having these devices produced in inexpensive 200mm fabs. But there isn’t enough 200mm capacity, and the margins are lower than 300mm. This presents several challenges for foundries. First, vendors must continue to invest and upgrade the various processes in 200mm. One example is automotive, where customers want an updated process even if it’s built in 200mm. “The industry needs to continue to invest in new technologies. It seems like we can’t develop those technologies fast enough,” Applied’s Rosa said. • Acquire a company with 200mm fabs. • Build new 200mm fabs. • Add more 200mm capacity. • Move customers from 200mm to 300mm. • Build a 300mm fab instead. Going the acquisition route is one idea. Over the years, foundries have acquired companies to gain access to technology and capacity. But it’s an expensive option. “Anybody who has an 8-inch fab and is considering selling is putting a good premium on it,” UMC’s Ng said. Instead of going these routes, many foundries are moving some chips from 200mm to 300mm. That makes sense for some but not all products. “We are trying to find solutions for customers on 200mm. We believe part of that will be moving some of those customers into a 300mm platform where it makes sense,” he said. Meanwhile, foundry customers also face some challenges. Besides securing enough capacity from their suppliers, customers must evaluate the foundry landscape. Each foundry is different and each one offers various capabilities. Plus, there are some new players in the arena. Last year, SkyWater acquired Cypress Semiconductor’s 200mm fab in Bloomington, Minn. Previously, Cypress’ fab in Bloomington provided foundry services. With the acquisition of this fab, SkyWater offers foundry services with a twist. It positions itself as a specialty foundry, with CMOS processes as well as technologies for biotech, silicon photonics, quantum computing and superconducting. SkyWater has one 200mm fab with 0.35-micron, 90nm and other processes. “If you look at some foundries, they have very high volumes but they don’t like customization. The ability to customize is something that you pay a lot of money for. And depending upon your size, they may not be interested,” said Thomas Sonderman, president of SkyWater. Meanwhile, IDMs and foundries want to expand their 200mm capacities. So where can you buy 200mm equipment? Chipmakers can buy used gear from fab equipment makers, used equipment companies, brokers, or through online sites such as eBay. Some chipmakers also sell used equipment on the open market. In recent times Applied Materials, ASML, KLA-Tencor, Lam Research, TEL and other equipment makers have been making new 200mm equipment. At the start of 2018, the industry required around 2,000 new or refurbished 200mm tools to meet fab demand, according to SurplusGlobal, a supplier of secondary equipment. At the start of 2018, though, there were only 500 available 200mm tools on the market, according to SurplusGlobal. Regardless of the short-term outlook, 200mm is expected to remain viable for some time, so fab managers must procure equipment and spares to meet demand. Buying 200mm tools from a vendor boils down to several factors—quality, reputation and service. Even then, there are challenges buying gear, whether it’s from an OEM, used equipment vendor or elsewhere. Not all suppliers of 200mm gear are alike. Some offer new tools, while others refurbish existing ones. There are even cases of firms that sell systems that are sub-standard or simply don’t work. At Applied, meanwhile, the fab tool vendor builds new 200mm equipment and also refurbishes them in various segments. Typically, it’s a build-to-order business with lead times ranging from 12 to 16 weeks. Others also see growth in the arena. “We see continued strength in our 200mm business for the foreseeable future. Our planning horizon is 2030, and there are some signs that date could extend even further. It’s why we continue to invest heavily in enabling technology, productivity improvements, and obsolescence solutions,” said Evan Patton, vice president and general manager of the Reliant Product Group at Lam Research. Demand is brisk for 200mm tools, although Lam is keeping up with the order rates. “While there may be a shortage of used tools on the secondary market, there is no shortage of 200mm equipment in Lam’s portfolio,” Patton said. Lam is developing new and refurbished 200mm tools, such as etch, deposition, and clean. “We are investing in developing new tools to enable advanced devices in the automotive, IoT and RF markets,” he said. Just how long the 200mm equipment boom will last remains a question. For now, business looks good this year and next. “We see 2019 as being another strong year for the equipment suppliers and the IDMs. Fab space is getting tight as IDMs try to squeeze new tools onto their manufacturing floor,” said Kevin Chasey, senior vice president and deputy general manager at TEL. TEL supplies a range of 200mm systems, such as deposition, etch, cleans and track. Many platforms are capable of running both 100mm/200mm wafer substrates. While 200mm equipment demand looks healthy, vendors are keeping a close eye on a situation that could impact the order rates. “Because wafer starts in 200mm are forecasted to continue to grow through 2021, we expect continued demand for 200mm capacity for a few years,” said Ian O’Leary, senior director of marketing, mature service, systems and enhancements at KLA-Tencor. Still, automotive device makers will require 200mm, especially in the area of defect inspection. In automotive, OEMs demand zero defects in chips. Typically, device makers use wafer inspection gear to detect defects. “In this space, many of the tool models that are needed in 300mm fabs are also needed in 200mm fabs,” he said. To find latent defects in a 110nm process, a fab needs a defect inspection capability at 65nm. So, KLA-Tencor needs to build a 200mm inspection tool with 300mm capabilities. Clearly, 200mm is here to stay. A number of chips will require mature processes in 200mm plants for a long time. Still to be seen, however, is if the industry can ever get its arms around the supply chain. The current 200mm fab capacity demand should drive growth in the near future for this semiconductor market segment. The problem with equipment suppliers is that they can’t find the parts they need either. Simple components like valves used to be stocked items. Now you are lucky to find any component with less than six weeks lead time. Robotic components, actuators try 48 weeks!